Spec-Ops is a brand that has yet to disappoint me. Their products are functional and efficient. Their function before form design yields a product that is beautiful by virtue of its simple but brutal elegance. If you can’t tell, I’m a fan. 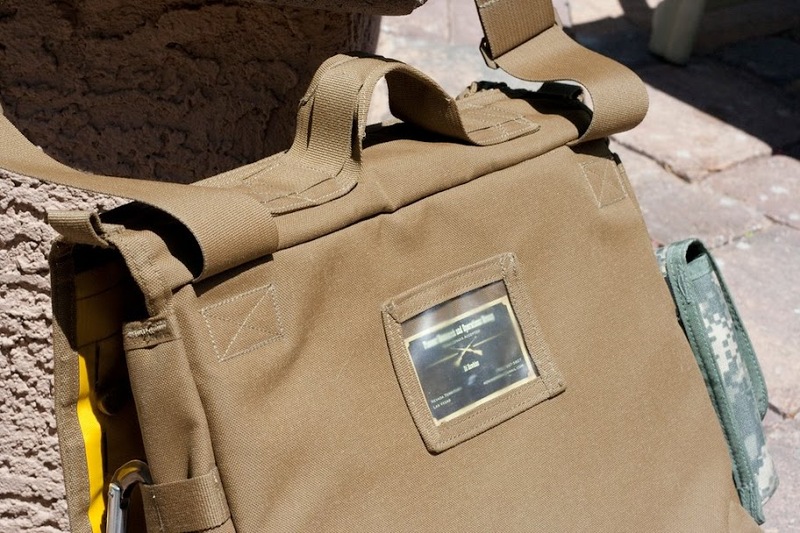 When I heard that Spec-Ops was releasing a messenger bag, I immediately checked their website for price and availability. When the website didn’t yield any information, I dropped them an email. I got a reply that same day from Steve, a customer service rep, who told me that they were in the process of revamping the website, but I could order by calling the 1-800 number. I called them and gave them my credit card number without even asking what the price was. Turns out it’s $161.95. I’ve been using T.H.E. Messenger Bag for a little over a month now. In that time I’ve carried it back and forth to the office daily, and taken a few trips. I haven’t spent any time in the field with it, but given that it’s constructed almost entirely of 1000D Cordura Nylon, I don’t think it would suffer much from being exposed to some dirt and water. When I say that Spec-Ops bags and packs are tough, it’s something of an understatement. Not only are they constructed of durable 1000D Cordura, but all the stitching is double or triple. Stress points are further reinforced. Handles and straps are not only triple and quadruple stitched, but additional layers of material are stitched in and stitch rolled to make for comfortable handling. I’ve been using T.H.E. Pack for more than three years now. Constructed of the same material, with the same design features, it’s rugged to the point of ridiculousness. Aside from a little dust and dirt from field and travel use, T.H.E Pack is still in immaculate condition. Not a single piece, element, or stitch has failed after years of abuse, and I expect T.H.E. Messenger Bag will have the same performance. 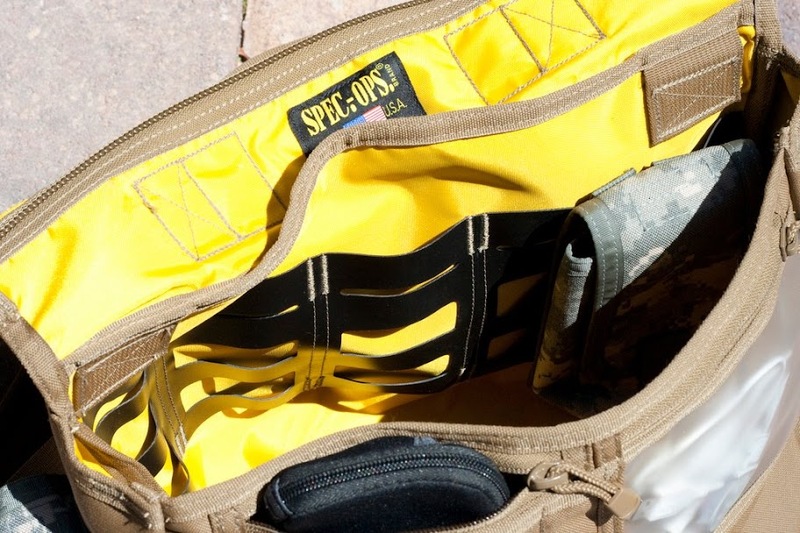 This isn’t just a simple flap over style messenger bag sewn up in durable nylon with a few MOLLE straps tossed in as an afterthought. T.H.E. Messenger Bag has a number of interesting and innovative design elements that set it apart from other messenger bags. I am not, in general, a fan of the flap over design. I’ll admit that it creates a more expandable volume of storage space, but it does so at the expense of ease of use and function. Having to unbuckled, unsnap, or tear at velcro panels every time you want in your bag, only to have to deal with the flap as well, is irritating and inefficient. Many designers deal with this problem by putting a zippered pocket in the flap. 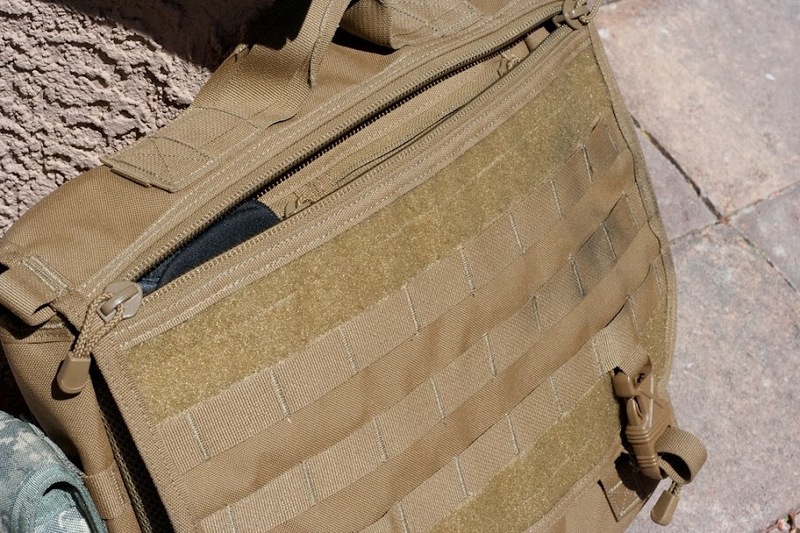 Since this pocket is generally substandard, not only does it not solve the problem, but now it increase the unwieldiness of the bag and the effort it takes to get in the main pocket. Spec-Ops slain this problem with their typical approach to functional design. Firstly, there’s no pocket in the flap. What it does have though, is a zipper that runs the width of the bag serving as a pass through to the main storage compartment. The heavy duty whispers open easily and provides easy access without compromising the strength of the bag. The shoulder strap is stitched to the rear of the bag, as opposed to the sides. This simple change allows the bag to hang differently off the shoulder and more closely conform to the shape of your hip. 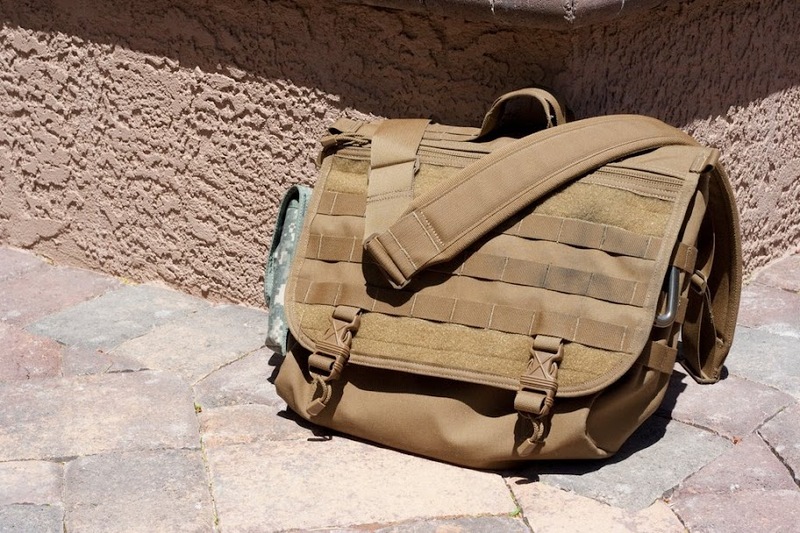 The bag sits more comfortably and securely on the shoulder, swings less when you walk, and doesn’t have the tendency to walk off the shoulder like other bags do. It’s one of those features that seems so simple in hindsight that I’m ashamed I never thought of it. Unfortunately, the shoulder strap isn’t detachable. I’m pretty certain this is to reduce the number of load bearing failure points, but I find it a little irritating. There are times that I’d like to remove and stow the shoulder strap, like when I’m on an airplane. Nothing disrupts your inflight drink service more than tripping the flight attendant with the shoulder strap of your bag. 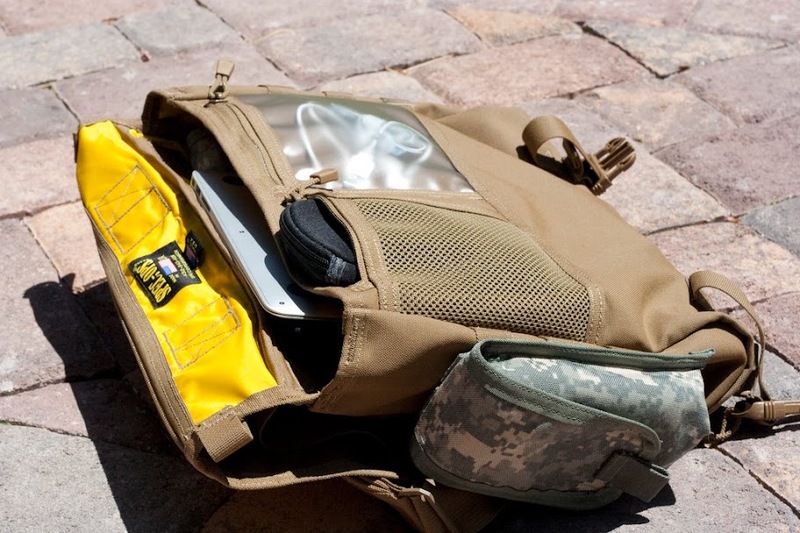 The bag is festooned with accessory straps that accept MOLLE, ALICE and Spec-Ops own Grid-Lok pouches. There’s even a Grid-Lok panel mounted on the inside of the bag against the yellow high visibility lining. This allows for a nearly limitless amount of customization and makes up for the lack of structured storage inside the main compartment. 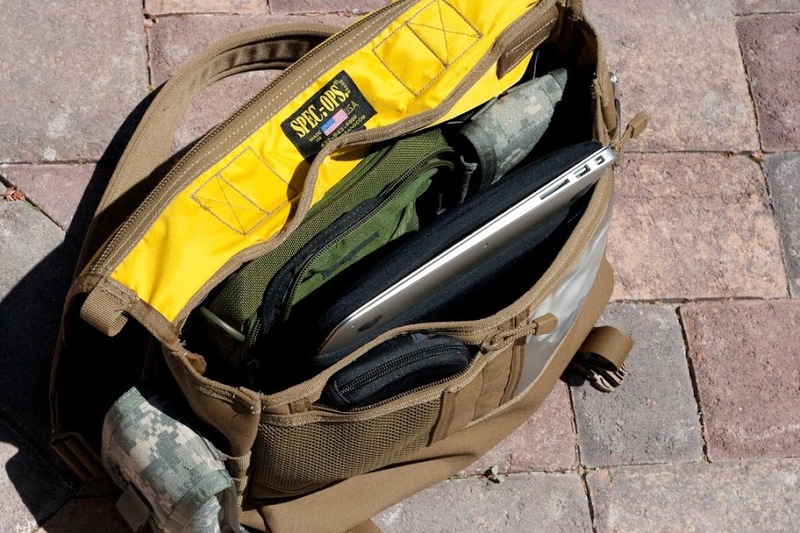 Yes, there’s no structured storage pockets inside the primary storage compartment. There are two smaller zippered pockets, one mesh and one in clear plastic, that are under the flap and on the main body of the bag. These are small pockets though, and really only good for smaller loose items like head phones, ear plugs, a folding knife, or a USB key. As you can see in the pic, these pockets are large enough for small items, but not large enough to slip in my Western Digital USB hard drive. The primary storage compartment is plenty large, at 12″ H x 16″ L, however it’s just one giant compartment. At first I was concerned by this lack of additional storage pockets. I feared that the contents of my bag would toss around, get mixed up, maybe even fall out. I didn’t want to jam my laptop in the same pocket as I did the rest of the flotsam I carry around with me. This is where the internal Grid-Lok panel really shined. I grabbed some extra pouches and accessory bags and hooked them up. Problem solved. Now I had smaller internal pockets for all those accessories you can’t leave home without; extra pens, flashlight, 4G mobile hotspot, etc. Despite finding a workable solution, I was a little disappointed that given the cost of the bag (nearly as much as the larger T.H.E. Pack), additional accessories would have to be purchased to make it functional to my desires. In the end though, that’s a pretty minor gripe for a product that is over all very good. This bag is durable, comfortable to carry, and has a number of key design improvements over the classic flap over messenger bag. It’s available in a number of colors and patterns including Coyote Brown, Multi-Cam, ACU and good old fashioned Black. I can’t imagine why, but if it’s not big enough for you, there’s an XL version that boosts the primary storage compartment to a whopping 12″x19″.